Just like people-food shopping and putting meals on the table for loved ones, when it comes to feeding your dog, there are many factors to consider. From what kind of food, to when and how to feed your dog, here’s a primer on keeping your furry best friend fueled. There are many options of dry, canned, dehydrated, homemade, and raw dog foods. The most popular and cost-effective is dry, bagged kibble. Reading the ingredients and doing a little research will help you decide on the brand that is best for your dog and you. Canned food can be used as a supplement (typically) and should also be chosen based on its ingredients. Dehydrated food is a balanced option typically for those transitioning to raw. Homemade food should be highly researched to make sure it’s nutritionally balanced for your dog. A raw diet can be a great alternative for many breeds, but requires due diligence in research and consultation with others who have experience with raw dog food. Sometimes a combination of two types of food can be a good choice, like adding a little canned food to dry kibble. Overall, for whatever combination of food types you choose, it is beneficial to choose the highest quality ingredients you can afford. And good luck with that! There are more than 8 million tons of pet food made every year and more than 15,000 brands of pet foods. To help with house-training efforts and to promote healthy stools, you should avoid fillers in your dog’s food. These go right through your dog’s system and come out as extra waste. Wheat, corn, and soy are common allergy-triggers for dogs and also should be avoided. As you’re reading the list of ingredients, pay careful attention. Dog food manufacturers are required by federal law to list all of a product’s ingredients in descending order of their pre-cooking weights (just like the labeling for people food). And that automatically and mathematically makes the first few ingredients the most abundant items in a product. In the first five ingredients, it is best to have at least two, but preferably three proteins or protein-meal sources such as beef, chicken, fish, lamb, and venison. Protein by-products are not considered valid sources of protein from a nutritional standpoint. 3. Scheduled Feedings or Free Feeding? Most professionals will agree that typically, scheduled feedings are a better choice. This is more important for growing dogs, dogs with any behavioral or medical issues, and senior dogs. 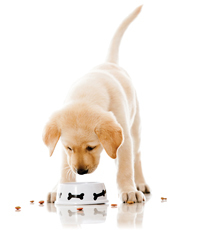 Keeping track of how much food your dog is eating is important at all developmental stages. How much you feed and how often depend on age, size, and weight of your dog. In general, feeding two to three times a day is typical. Yes, even dogs can be picky eaters! Developing a ritual for feeding can be beneficial. Feed your dog about the same time daily after his walk or by having him do a few commands or tricks. Stimulate the appetite with small treats as a reward for a command. Also, adding small amounts of something with an odor (examples: mashed sweet potato or pumpkin, yogurt, hamburger, chicken) to their kibble can entice dogs to eat as well. Remember, dogs learn by smelling and smelling also intrigues them. A human has about 5 million scent glands, compared to a dog, with anywhere from 125 million to 300 million (depending on the breed). And get this – nothing smells bad to a dog! 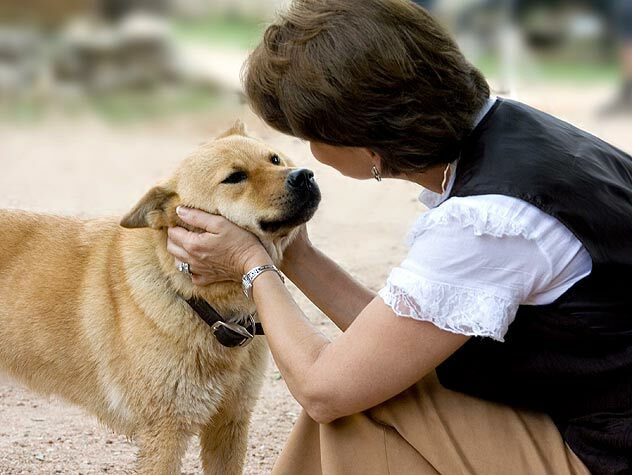 With dogs, the picky eater is usually the dog that does not relate food or eating to a reward. Feeding time should be a pay-off for work, whether that work is command(s), tricks, or overall behavior. Have your dog work for you before the reward of food is offered. Please avoid and seek medical advice if your dog ingests: chocolate, macadamia nuts, xylitol sweetener, raw dough with yeast, onions, avocado, grapes/raisins, alcohol, coffee grounds. Human food can be beneficial to feed your dog as long as it is a safe food and you feed it appropriately. Proteins like beef, chicken, and fish can supplement a dog’s diet. Carbs like sweet potato, rice, and pumpkin, and vegetables such as green beans, carrots, and peas can also be used as treats or as a supplement. But take note: It’s also important to prevent your dog from begging. Begin by not feeding your dog from your hand, plate, or the table at your eating time. Be consistent. Create a ritual during your mealtime by teaching your dog what to do while you are eating, such as command like, Go to your bed! or Stay out of the kitchen! Snacks and treats should only be used as a reward for a command or trick, or for good behavior. Be careful not to over-treat your dog. You should also look at the ingredients on treats and choose wisely. An easy way to avoid over-treating is to use kibble as a treat and increase the smell factor by adding in small amounts of something with an odor in the treat bag or container. By adding a few pieces of a smelly treat to kibble, it will be more appealing and your dog will want it more. Feeding rituals can be any work that your dog performs before being fed. It can be very simple, like having your dog sit while you prepare the food and put it down for him to eat. You can complicate commands by having your dog sit in another room as you prepare the food, or complete tricks or commands before you place the bowl of food on the floor. Use a consistent release word so the dog has permission to eat. Feeding time is always a great time to teach a new trick or command, plus you’re working on respect, impulse control, and bonding with your dog.